Finally, I finished! Normally it only takes me 2-5 days to finish a book but not this one. Nope, this one almost took me two weeks. Maybe because I had a mission to build, a family to take care of, a lowly blog to write or maybe because he writes so densely! (if you have read his books you hopefully know what I mean) I'm not sure I want to give you a review or a synopsis or whatever. I think you should have to go through the pain and the scariness yourself. After I read The Omnivore's Dilemma, I really started thinking critically about the food me and my family ate. I had always thought about it but didn't give it that under the microscope, CSI treatment. Even though we still have fast food, instead of maybe once every couple weeks, it's now once every couple of months. And I still feel guilty, Thanks a lot, Mr. Pollan. Why start reading another horror novel? Seriously, Barnes and Noble need to put his books under the horror genre, the self help genre and of course the food genre. Why do I need to get scared straight? I already cook 99% of my family's meals and I know I don't use high fructose corn syrup or a ton of processed food. Well good news, apparently I'm doing the right thing there. 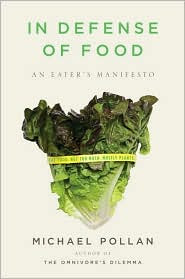 The first half of In Defense of Food, Michael Pollen writes about how nutrients won out over food in the eyes of the FDA and the Senate Select Committee on Nutrition and Human Needs. This little committee in 1977 issued a little report about the Dietary Goals for the United States stating that Americans should cut down on their consumption of red meat and dairy products because they had noticed that the rates of coronary heart disease had soared since World War II. Well, I'm sure you can guess what happened next. The meat and dairy industries got involved and all hell broke loose. The report was rewritten with the motto, "Speak no more of food, only nutrients." Now the foods aren't the problem, the nutrients are the problem. Which is why the FDA can approve cloned meat as safe for consumption, as long as the nutrients are the same as the real beef, there's no problem. Pollan also goes into about omega-6 and 3's, corn and soy, processing of whole foods to fortified foods (it's bad, it's bad, it's really, really bad!) and the calories we eat. Four crops account for 2/3 of the calories we eat. Corn: 554 calories. Soy:257. Wheat:768. Rice:91. He breaks this down like this; we historically consumed 80,000 edible species, and 3,000 have been in widespread use. We need in between 50-100 different chemical compounds and elements to be healthy. We are getting by on mostly four different processed products and that can't be good. Are you hiding underneath your blankets, yet? Yeah, so was I but I continued reading and here's where the common sense stuff kicked in. The last half of the book goes into what and how you should eat. It is surprisingly funny and not preachy. I won't go into all of them. 1. Don't eat anything your great grandmother wouldn't recognize as food. Such as Go-Gurt. Is it a tube of toothpaste? and how in the world did yogurt get so complicated? Is it a whole food or a food product? 2. Avoid foods that make health claims. 3. Buy foods that you have ingredients you can pronounce or have less than 5 ingredients. 4. Get out of the supermarket because you won't find any high fructose corn syrup at the farmers market. 5. Regard nontraditional foods with skepticism. 6. Don't look for the magic bullet in the traditional diet. 8. Do all your eating at a table. 9. Try not to eat alone. 10. Don't get your fuel from the same place your car does. Did you know U.S. gas stations make more money selling food and cigarettes than gasoline. And apart from milk and water it's all highly processes nonperishable snacks. 11. Cook your own food. 12. If you can, plant a garden. The book wasn't so scary, after all. I would rather read a Michael Ruhlman or Anthony Bourdain book about food but I'm sure those are highly processed books and In Defense of Food definitely wasn't that. *side note: Speaking of Michael Ruhlman. Ruhlman is writing a cookbook with Michael Symon, of Lola and Iron Chef America Fame.